Red curry is the one of the base Curry dish of Thai. 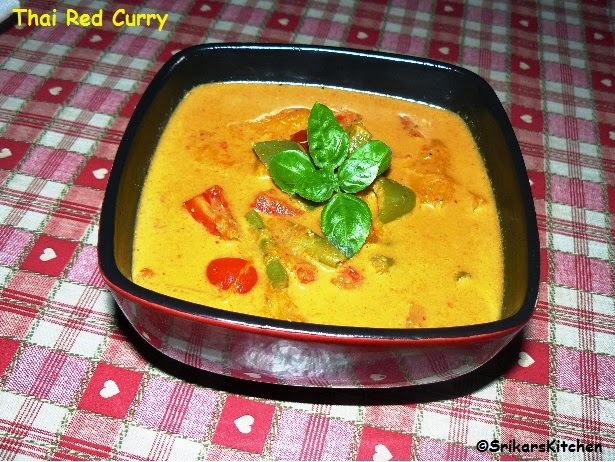 This is very delicious & tasteful curry.Adding coconut milk adds flavour to this curry. I already tried Thai green curry. Normally i tried some Paneer recipes or veg recipes or Dal recipes . Once i tried this recipes, i love this really well and started to make atleast once a month. You can add more vegetables like mushroom, carrot,tofu,small aubergines, courgette,etc.In hotels or restaurants they are adding fish sauce in it. Any vegetarian friends are ordering in outside, make sure there is no fish sauce or chicken stock in it. Make a paste for all the above red curry ingredients & keep it aside. Heat oil in a pan, add ground paste , allow to saute. Add all vegetables& saute.Add little water & allow to cook. Add coconut milk & allow to boil & Serve with plain rice or Thai coconut rice or Thai noodles.